Monday is my Future Brother-in-law’s 30th birthday!!! Happy birthday, Chris!! 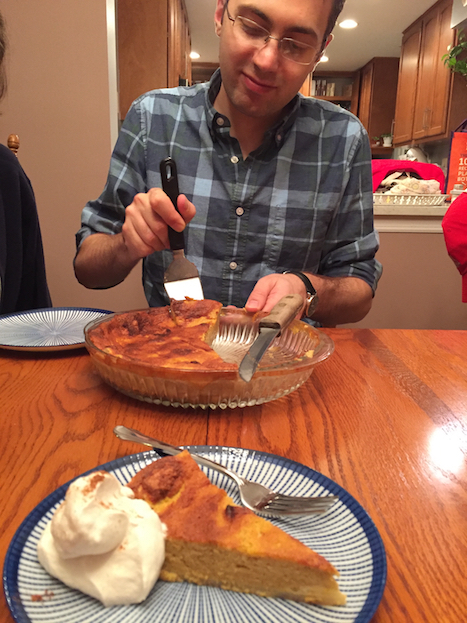 In honor of his birthday, I’m sharing his favorite pie. 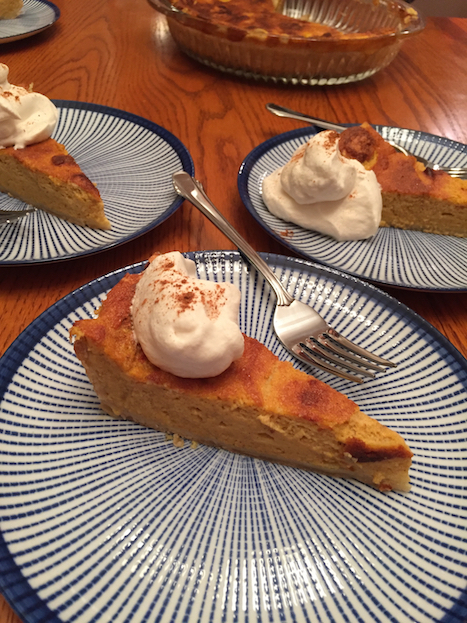 This pumpkin pie mixes in sour cream to the filling keeping it airy and fluffy, almost soufflé-like. If you make it the right way, you have to start with a real pumpkin. Now that may seem rather intimidating, but cooking a pumpkin is really quite easy. You’ll want to start with a sugar pumpkin, one of those small cute cooking pumpkins, or another good cooking pumpkin. Preheat oven to 350°F. Cut the top off of one sugar pumpkin and cut in half, scrape out seeds and stringy fibers. Place on a baking sheet, cut side down, and coat the outside lightly with oil to prevent burning. Bake for 30-45 minutes, or until a fork can easily pierce through the skin. Remove from oven and allow to cool. Measure out 1 ½ cups cooked pumpkin. In a food processor or blender, mix pumpkin together with scant ½ cup sugar, 1 tsp cinnamon, ½ tsp ginger, ¼ tsp nutmeg, 1/8 tsp cloves, 1/3 tsp salt. When well mixed add 1 cup sour cream and 3 egg yolks (reserving the whites for later). 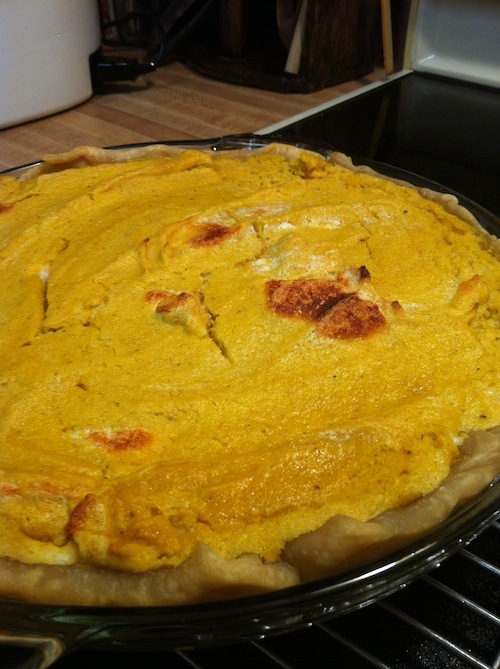 Roll out pie crust to fit the pan. Put squash and sour cream mixture into a pot and cook gently, stirring frequently, until slightly thickened. Beat egg whites until they form soft peaks, then sprinkle in ¼ cup sugar and beat until stiff but not dry. Fold egg whites into the pumpkin mixture. Pour mixture into the prepared pan. Bake for 40-45 minutes or until puffed and brown. Let cool. Serve with fresh whipped cream (1 ½ cups heavy cream, 1 ½ Tbsp sugar, ½ tsp vanilla).